The name of this festival alone tells you what to expect at its commercial tasting, but that’s just one part of a weekend of events. The Beaver Run Resort and Conference Center will also play host to beer dinners, sensory workshops, seminars and a homebrew competition. Should you somehow find time to pull yourself away from a full weekend of beer events, fresh powder awaits just outside. How better to warm up in January than with chili and beer? This ninth annual festival takes place in Galveston’s historic downtown strand district, where you can sample from among 60 different chilis and more than 100 different beers. Ticket options allow for chili sampling, beer sampling, or both. Weekend festivities also include a 5K run/walk, live music, a washer pitching tournament and a jackpot margarita contest. For the past nine years, brewers and cheesemakers from the midwest and across the nation have gathered in Madison for the Isthmus Beer and Cheese Fest. General admission tickets allow for unlimited sampling from 2-6 p.m., while premium tasting tickets get attendees in early at noon for exclusive beers and cheeses. Brewed with wheat and oats in addition to tangerine, this hazy IPA has a rich and juicy, citrus-forward profile that starts with a hop bill of Galaxy and Citra. Before this January, Tangerine Space Machine was the most purchased Crowler fill at New Holland’s taprooms and the most popular beer among its employees. It will now be available in limited quantities, mostly in the Midwest, on draft and in six-packs of 12-ounce cans. Formerly known as Track #10, Bat Out of Hell garnered the highest reviews of Lost Abbey’s 2012 Ultimate Box Set of beers and brought home bronze medals from the 2012 Festival of Wood and Barrel-Aged Beers and the 2012 San Diego International Beer Festival. A bourbon barrel-aged version of Serpent’s Stout, complemented by the adjuncts of vanilla beans, coffee and cacao nibs, this beer moves from notes of chocolate, espresso and creamy caramel to a sweet vanilla and oak finish. Bat Out of Hell will be available in 375-mL cork and cage bottles and on limited draft. An homage to both the spruce trees that fill Tongass National Forest—as well as much of the wilderness of Alaska—and the use of those trees’ tips in local cuisine, this beer incorporates that ingredient as an adjunct, melding its tart, lemony and piney flavor profile into an aromatic IPA. 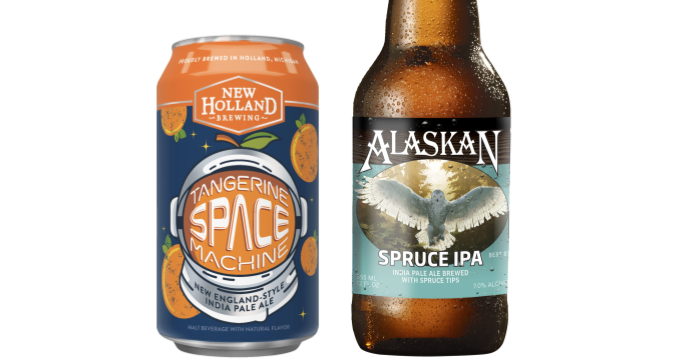 Alaskan Spruce IPA will be available in six-packs and twelve-packs of 12-ounce bottles, as well as on draft.